Multi-tab browsing has become the most basic requirement of modern browsers. Open a web page, see something on it or clicking a link that will lead you to a different web page in another tab and that leads to another and goes on. Soon it becomes too many to handle. At this stage, you can’t even differentiate the tabs as it all seems to be the same (once the tab titles are hidden). I have seen people who have kept the tab opened for a very long period, say a week. The kept it open believing that they can check it when they feel like, unfortunately, they get accustomed by those few open tabs. In the end, the tab was always there, doing nothing. The joke, Sometimes those tabs are closed without the second visit. Too many opened tabs require big memory for the computer. If it exceeds the limit, the browser becomes too slow. You can feel the slowness when you try to switch tabs. Here, there’s no need to discuss the technical reason behind it. Among the 10 new tabs you open, more than 5 are diversions. A story leading to another relevant or irrelevant story, clicking an ad, checking an information that comes to mind which is entirely opposite to the task at hand, even a too long article which you want to read it later, etc etc. Checking facebook, twitter are other additional diversions which I am not taking in to account for this scenario as the current topic is on ‘tabs’. It is always good practice to use fewer tabs and put other tabs to sleep until you need them back. 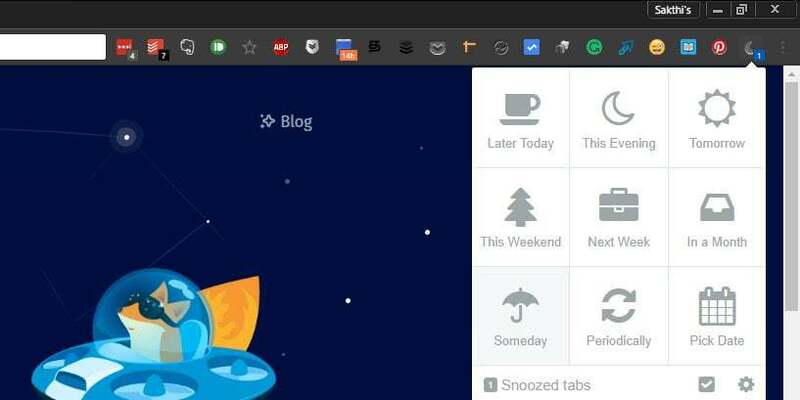 Chrome has an extension called ‘Tab Snooze‘ which helps you to put the tabs to snooze. You can decide the time when you need to be reminded of the tab you going to snooze. Firefox is developing a similar function as a part of their next-generation features. You can get this option when you accept to use firefox’s ‘Test Pilot’. It’s simple, just visit this link from Firefox.